Voyager I and II were launched in 1977, and after 33 years they are both still doing well and sending information back home. Voyager I is currently 119 AU from Earth, while Voyager II has travelled a distance of 97 AU. This means that the probes are now leaving the heliosphere. Their current positions allow them to detect Lyman-alpha emission from star forming regions in the Milky Way for the first time. Lyman-alpha is an emission line of hydrogen at 121.57 nm – in the far-ultraviolet part of the electromagnetic spectrum – and is ubiquitous in astrophysical objects. Lyman-alpha emission results from UV light hitting neutral hydrogen atoms and splitting them into protons and electrons. The Lyman-alpha is emitted when particles recombine to form an excited hydrogen atom. Since young stars emit a lot of UV radiation and star forming regions are filled with hydrogen, we can expect a lot of Lyman-alpha near young stars. Lyman-alpha is used by astronomers to investigate star forming galaxies at redshifts between 0.3 and 6 where the Lyman-alpha line is shifted to longer wavelengths (between the near-UV and visible). Until now Lyman-alpha has not been detected in the Milky way because the radiation at this wavelength is “obscured” by our Sun. The small amount of hydrogen from the interstellar medium that finds it s way into our solar system scatters the Sun’s Lyman-alpha emissions in random directions, which effectively produced a “fog” of Lyman-alpha, obscuring more distant Lyman-alpha radiation from within our Galaxy. The Voyager spacecrafts are now far enough from the Sun that the Lyman-alpha emission from the Milky Way galaxy is finally revealed. Lyman-alpha is easily scattered by the interstellar medium (ISM) and the intergalactic medium (IGM), and hence can be used to provide information about the column density of neutral hydrogen in the IGM. Within galaxies Lyman-alpha is even more easily scattered by dust, which provides information about their dust content. The problem is that we know almost nothing about the spatial distribution of dust and gas in high redshifts galaxies, and so by analysing the Milky Way Lyman-alpha we can extrapolate to infer the amount of dust and gas in distant galaxies. Weather permitting, this Saturday NASA will launch the Mars Science Laboratory (MSL) – a rover named “Curiosity” – with the aim of determining if Mars ever had, or still has today, an environment that could sustain microbial life. Curiosity is planned to liftoff on Saturday 26 November (at 10:02 a.m. ET) aboard an Atlas V rocket from the Kennedy Space Centre in Florida for an 8 month trip to Mars. To help determine the habitability of Mars, there are four main science goals of Curiosity: (1) to determine whether life ever arose on Mars, (2) to characterise the Martian climate, (3) to characterise the Martian geology, and (4) to prepare for human exploration. To achieve these goals there are a set of scientific objective for the mission which will include a number of biological, geological, geochemical, atmospheric, and surface radiation measurements. Curiosity carries 11 instruments (living up to its name Mars Science Laboratory! ), which include 3 cameras, 4 spectrometers, 2 radiation detectors, and an environmental and an atmospheric sensor. The total weight of Curiosity is about 900 kg, and it is the size of a small SUV, measuring about 10 x 9 x 7 foot. Scientists studying data from NASA’s Galileo probe, which ended its mission to Jupiter in 2003, have discovered what appears to be a body of liquid water the volume of the North American Great Lakes underneath the surface of Jupiter’s moon Europa. Europa has a young, icy surface and sustains a liquid water ocean below an ice shell of highly debated thickness. Galileo spacecraft images of two roughly circular, bumpy features on Europa’s surface called chaos terrains were examined. One of them, Thera Macula is a region of likely active chaos terrain production above a large liquid water lake. Based on similar processes seen here on Earth — on ice shelves and under glaciers overlaying volcanoes — the researchers developed a four-step model to explain how the features form on Europa. 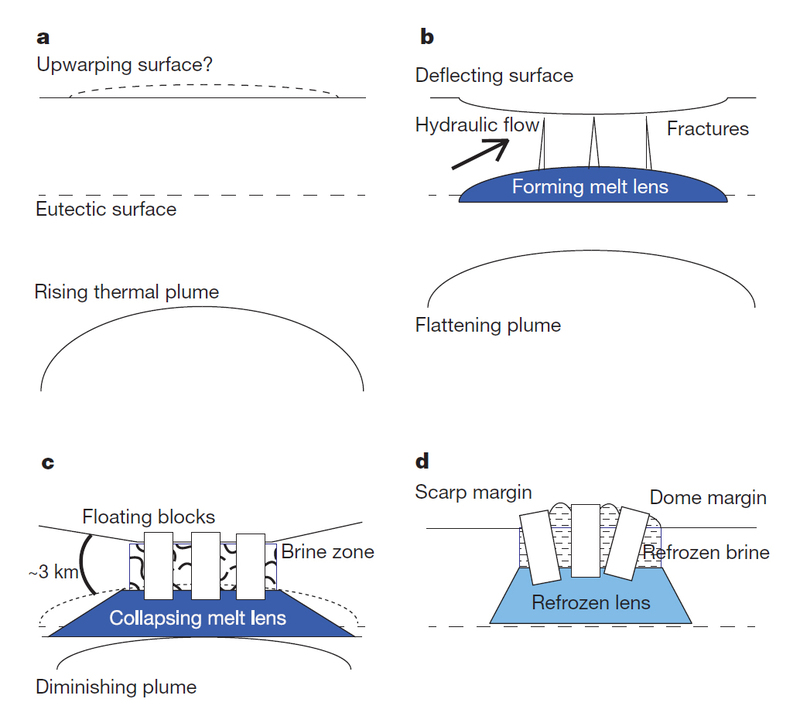 The four steps are: (1) Ascending thermal plumes of relatively pure ice produce surface deflection in response to volume change associated with melting of the ice (2) Resulting hydraulic gradients and driving forces produce a sealed, pressurized melt ‘lens’ (see figure) (3) Extension of the sinking brittle ice ‘lid’ over the lens ultimately generates deep fractures, allowing brine to percolate through overlying ice, forming a fluidized granular ice matrix and calving ice blocks. (4) Refreezing of the melt lens and now brine-rich matrix results in topographic heterogeneity. i.e. “chaos terrains”. This “lens-collapse” model makes testable predictions: liquid water may be found where the surface subsides and blocks ‘float’ above the surrounds. At Thera Macula, we are probably witnessing active chaos formation. 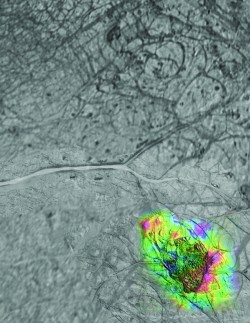 The large concentric fracture system encircling Thera Macula resembles those of collapsing ice cauldrons. The inferred lakes are several km below the surface, hence, the only confirmation of their existence would come from a future spacecraft missions that could designed to land on and perhaps drill into the ice shell. Astronomers have long been looking for the new black and it looks like they might have found it. Allowing only the desired light to reach the detector of an instrument has been an ongoing battle in astronomy. These days instrument developers apply black paint to instrument components such as spiders, baffles and tubes, to effectively absorb 90 percent of stray light which would otherwise overwhelm the detector. In infrared-sensing, the thermal heat radiated by the detectors can swamp the faint infrared signals so black paint is also used to absorb heat and re-radiate it away from the instruments. However black paint turns shiny when exposed to the super-cold cryogenic temperatures needed for infrared astronomy, making it less efficient. At longer wavelengths the inefficiencies of black paint requires the use of epoxies loaded with conductive metals, which adds weight to the instrument that is obviously undesirable for a space-based observatory. Multiwalled Carbon Nanotubes have been found to offer an order-of-magnitude improvement in surface treatments by NASA’s Goddard Space Flight Center researchers, resulting in a stray light reduction by a factor of 10,000. 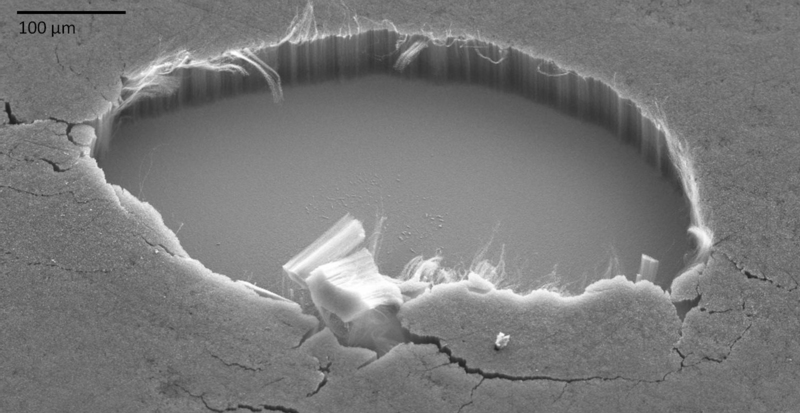 Goddard researchers John Hagopian and Stephanie Getty and co-worked used carbon nanotube technology to create a material that absorbs 99 percent of ultraviolet, visible, infrared, and far-infrared light that hits it. The material is also less dense and remains black without the need for additives, making it very attractive for space flight instruments. First detected during the 1960s and officially confirmed in the 1973, gamma ray bursts (GRBs) are the brightest explosions in the universe. There are two types of GRBs: long burst (longer than two seconds) are associated with supernova explosions, while short bursts are thought to originate from the merger of two compact objects such as neutron stars. Two instruments on board the NASA Fermi Gamma-ray Space Telescope are used to detect and study GRBs: the Gamma-ray Burst Monitor (GBM) and the Large Area Telescope (LAT). Once a GRB is detected and its position determined, requests for follow-up observations of the visible and infrared afterglow are sent out to ground-based observers via the groups such as the Gamma-ray Coordinates Network (GCN). These follow-up observations might be conducted by some of the world’s largest telescopes, including the ESO Very Large Telescope (VLT). 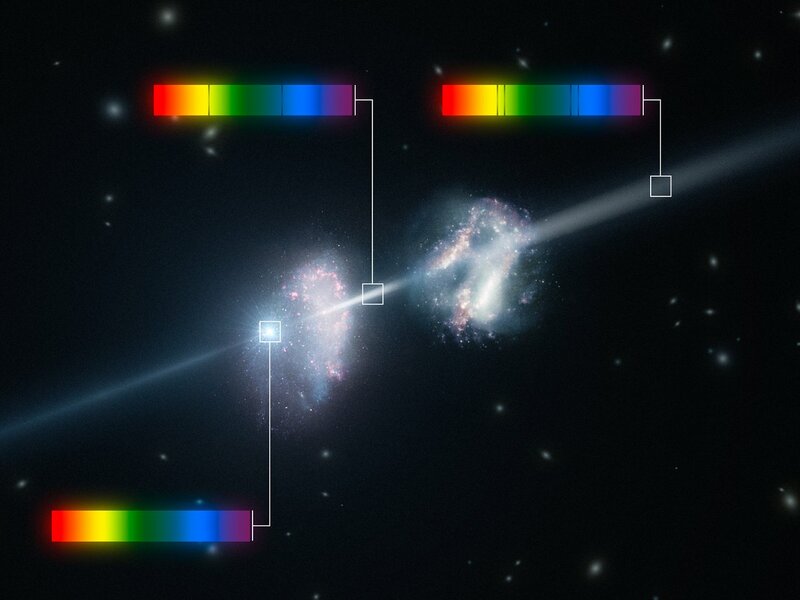 In a paper submitted to MNRAS, Sandra Savaglio and collaborators analysed the VLT spectrum of the GRB 090323 afterglow. The VLT observations show that the emission from GRB 090323 passed through its host galaxy and another galaxy nearby, which are about 12 billion lightyears from Earth. Surprisingly, these galaxies are rich in heavy elements. Astronomers expect very distant galaxies to have low metallicities because there has not been enough time for stars to produce the heavy element. Savaglio et al. conclude that these galaxies must be forming new stars at a tremendous rate to explain the observed GRB spectra. The discovery of these metal rich galaxies at high-redshift (z > 3) questions our understanding of the cosmic chemical evolution. The asteroid 21 Lutetia was discovered in Paris (and hence the name Lutetia) by Hermann Goldschmidt in November 1852. The origin of 21 Lutetia has intrigued astronomers. It has been classified as an M-type asteroid, which are generally bright, metallic bodies which are sometimes mixed with rocky materials and have mostly featureless spectra. They are thought to be the metallic fragments of the cores of differentiated planetesimals and the parent bodies of the iron meteorites. Lutetia, however, also has spectral features resembling the C-type asteroids, which are darker carbonaceous bodies that are thought to derive from primitive undifferentiated bodies. Lutetia’s spectra suggests the presence of hydrated (meaning water-containing) minerals, which also points to a more primitive surface. On 10 July 2010 Lutetia was approached at a distance of about 3200 km by the Rosetta spacecraft, which is on its way to the comet 67P/Churyumov–Gerasimenko. The aim of the asteroid fly-by were to try to determine the asteroid’s true composition and decide whether it is an M-type or C-type asteroid; to accurately determines its mass and size and hence its bulk density; and of course to test Rosetta’s scientific instruments as it continues on to the comet. Rosetta accurately mapped the entire surface of the knobbly 121 km x 101 km x 75 km asteroid, as well as measure its gravity. Results of the Rosetts analysis of Lutetia have been published in this week’s edition of the journal Science. Observations made with the Rosetta OSIRIS (Optical, spectroscopic and Infrared Remote Imaging System), with the help of ground-based observations and models, have derived a volume of 5.0×1014 m3. Doppler shift of radio signals from the spacecraft suggest a gravitational perturbation mass of 1.700 ± 0.017 × 1018 kg, which is much lower than expected from ground-based observations. Thus Pätzold et al. derived a bulk density of 3.4 x 103 kg/m3. Compared with the low value of the total mass, this high density indicates a non-chondritic bulk composition enriched in heavy elements like iron. Sierks et al. show that the OSIRIS images provide evidence of a complex geology and an ancient surface which, together with the high bulk density, suggests partial differentiation of the asteroid and hint that Lutetia may be a primordial planetesimal. Coradini et al. used the Rosetta VIRTIS (Visible, InfraRed, and Thermal Imaging Spectrometer) to investigate the surface composition and temperature of Lutetia. They found no absorption features from either silicates or hydrated minerals across the spectral range 0.4–3.5 μm, and nor did they find any spectral signatures of surface alterations resulting from space weathering. They suggest that Lutetia is likely a remnant of the primordial planetesimal population, unaltered by differentiation processes and composed of chondritic materials of enstatitic or carbonaceous origin. The absence of absorption features coupled to the large bulk density is a strong indication that Lutetia has a metal-rich composition. It is through that the interior of Lutetia melted, likely due to heating by short-live radioisotopes, causing partial differentiation which allowed a core to form but which did not effect the primordial surface. This is a surprise, as it was previously thought that only two types of asteroids existed: fully differentiated or totally unmelted. 21 Lutetia appear to be a new type of asteroid with a melted interior but an unmelted crust. Blue stragglers are a peculiar class of stars which lie on the main sequence of the Hertzsprung-Russell diagram in a region that is bluer and more luminous that the main sequence turn-off point. Theories of stellar evolution tell us that the most massive blue stars will burn brightest and therefore exhaust their supply of hydrogen more quickly than lower mass stars. Once their core hydrogen supply is exhausted, they should move off the main sequence and migrate up the giant branch. However, the luminosity and temperature of blue stragglers puts blue-ward of main sequence turn-off point, which puzzled astronomers since their discovery. They must be normal main sequence stars that have recently increased in mass. But how can main sequence stars increase in mass? A hint to their formation comes from the fact that blue stragglers are only found in stellar clusters. In evolved clusters they easily stand out amongst the mostly red old stellar population. Since stars in clusters must all form at about the same time, this suggests that bright blue stragglers formed much later then the other cluster stars. In dense globular cluster systems the distance between stars is small and so stellar collisions are relatively common. This lead astronomers to hypothesis that blue stragglers might form as a result of the merger of hierarchical triple systems or via direct collisions between two old red stars, producing a higher mass and hence bluer and brighter star. In this week’s edition of the journal Nature, Aaron Geller and Robert Mathieu present new results about the mass transfer origin for blue stragglers. They studied the old (7 Gyr) open cluster NGC 188, whose blue stragglers have a very high long-period binary fraction: 75%. Analysis and modelling of the Doppler shift of the blue stragglers showed that their companions all have masses of about half a solar mass. They argue that this rules out the collisional origin of blue stragglers and likely the merger scenario as well. Their data supports a mass transfer origin – at least for the long-period blue straggler binaries in NGC 188 – where a blue straggler forms when a main sequence stars accretes mass from its evolved binary companion. To prove their hypothesis, Geller & Mathieu aim to detect the flux of the white dwarf companion, which will allow them to distinguish between the binary mass transfer model and merger hypothesis. desert at an altitude of 5,000 meters has officially released its first science data. ALMA currently comprises 20 high-precision antennas working together at millimeter and submillimeter wavelengths. ALMA has state-of-the-art receivers that cover atmospheric windows from 84–720 GHz (3 mm – 420 μm). By 2013, ALMA will have 66 antennas working together as one telescope with a maximum baseline of 16 km. Observing at mm and sub-mm wavelengths allow astronomers to study extremely cold objects in space, including the dense clouds of cosmic dust and gas which form stars and planets, luminous galaxies undergoing starbursts, and very distant objects in the early Universe. The first official ALMA science data released is of the Antenna Galaxies, NGC 4038 and NGC 4039, using only 12 antennas. This galaxy pair is the merger of two disk galaxies. The merger event has produced many regions of new star formation. The image shows the cold gas regions seen by ALMA – detected via carbon monoxide molecules in giant molecular clouds – in the two disk regions and the collision area of the merger – out of which new stars will form. Subsequent observations with more antennas, with larger baselines will provide superior resolution images. Antennae Galaxies. Left: mm and sub-mm view from ALMA. Right: optical view from ESO Very Large Telescope. ALMA peers into the Universe, The Age vodcast featuring Swinburne PhD graduate Annie Hughes! This year’s Nobel Prize in physics was jointly awarded to Saul Perlmutter from Lawrence Berkeley National Laboratory, and Brian Schmidt from Australian National University and Adam Riess from Johns Hopkins University for the discovery of the accelerating expansion of the Universe through observations of distant supernovae. In the 1990s, two teams used high redshift type Ia supernovae (SNe Ia) to determine if the universe will continue expanding forever or whether the expansion will eventually stop and contract, resulting in the ‘Big Crunch’. Perlmutter led the Supernova Cosmology Project while Schmidt led the High-z Supernova Search Team. SNe Ia are standard candles used by astronomers to measure extragalactic distance, and they can be used to determine the rate at which the Universe is expanding. It was assumed at the time that the universe would be decelerating due to the gravitational pull of distant galaxies after the rapid expansion of the Big Bang. However, the results by both teams showed the opposite! Riess et al. (1998) found that the distances of the high-redshift SNe Ia were about 10%–15% farther than expected and their data unanimously favoured an eternally expanding and accelerating universe. The results of Permutter et al. (1999) also showed an accelerating universe. So what is driving this acceleration? Astronomers don’t yet know, but they have labled this unknown force as Dark Energy. Dark Energy is thought to constitute 73% of the composition of the Universe, the other 23% dark matter and the 4% ordinary matter. The Nobel Prize in Physics has been awarded 104 times since 1901 to recognise people who have made a significant discovery or invention within the field of physics. Using a data set of over 8,000 galaxy clusters from the Sloan Digital Sky Survey, astronomers have been able to test the behaviour of photons as predicted by Einstein’s theory of general relativity. Radek Wojtak of the Niels Bohr Institute at the University of Copenaghen and collaborators focused on the redshift properties of light coming from this large sample. The new results of Wojtak et al. is the first significant result of gravitational redshifts from galaxy clusters. The researchers have measured the difference in gravitational redshift of galaxies near the cluster centres and those at the cluster periphery. The total cluster mass was used to tell of the cluster’s gravitational potential. The gravitational redshift from typical galaxy clusters correspond to a velocity of about 10 km/s. The work shows that photons from cluster centres were redshifted in proportion to the distance from the center of the clusters, which agrees with the predictions of the general relativity. The results were published in this week’s edition of the journal Nature. So far, the effects of gravity on light have only been tested in our Solar System by measuring the the redshift of sunlight due to the gravitational effects of Mercury. These results are particularly timing as last week physicists at CERN announced the results of a neutrino experiment which measured particles travelling 6 km/s faster than the speed of light, which – if confirmed – violates Einstein’s theory of special relativity. NASA’s Wide-field Infrared Survey Explorer (WISE) was launched in December 2009 with the aim of surveying the entire sky for coolest and darkest regions of space in the infrared. Amongst the objects WISE is searching for include near-Earth asteroids and comets. WISE will determine the orbits, size and number of asteroids and comets which will help determine the likelihood of the Earth being a target. In 2007, William Bottke and collaborators published an article in Nature suggesting that the collisional break-up of the 170-m Baptistina asteroid approximately 160 million years ago produced the Baptistina asteroid family (BAF), and that over time dynamical processes involving the Yarkovsky/YORP effects put some of the BAFs on Earth crossing orbits. Bottke et al. (2007) argued that this shower of asteroids lead to the extinction of the dinosaurs 65 million years ago. Scientist from the WISE team have now confirmed asteroids from the BAF were not responsible for the extinction. 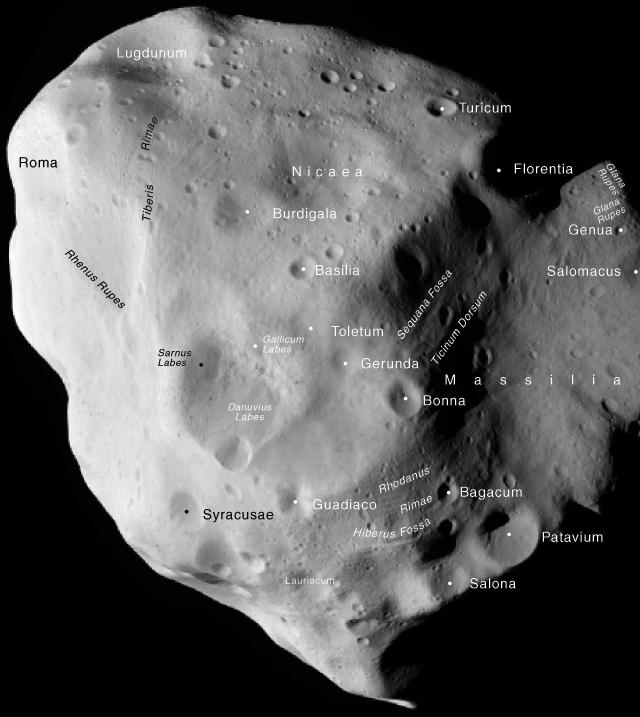 The infrared observations of Near Earth Object WISE project (NEOWISE) are more accurate in determining sizes than previous optical estimates, since the infrared light comes from the asteroid itself while optical light is reflected sunlight and to determine sizes one needs to know about the reflectivity of the object. NEOWISE has already cataloged 157,000 asteroids, including 1,056 members of the BAF. Joseph Masiero and collaborators have determined the original Baptistina asteroid break-up occurred closer to 80 million years ago, which does not allow enough time for the BAF to reach the resonance spot required to fling them towards the Earth. Combining the infrared data with optical data provides a much better estimate of the reflectivity, which the NEOWISE team hopes will help them determine the composition of asteroid belt objects and hence better characterise asteroid family groups. NASA’s Kepler mission is using the transit technique to search for extrasolar planets (and specifically terrestrial planets in their host star’s habitable zone) in a small region in the solar neighbourhood of the Milky Way. Kepler is monitoring more than 100,000 stars in the same star field for the 3.5 years of the mission. In February this year the Kepler team announced 1,235 planet candidates, of which 21 have so far been confirmed. Today the Kepler team announced the discovery of Kepler-16, which orbits not one but two stars – making it a circumbinary planet. The two stars are a K dwarf, with a mass of 0.7 that of the Sun, and a red dwarf with a mass of about 0.2 solar masses. They orbit each other in 41 days (a=0.22 AU, e=0.16), while Kepler-16 orbits the binary pair in 228 days (a=0.7 AU, e~0.0). Since both stars are dwarfs, the orbit of Kepler-16 is outside the habitable zone of the system. Scale diagram of the Kepler-16 system, from Doyle et al. (2011). Stars marked with A and B, planet marked with b. System centre of mass marked with +. The Earth (and the other terrestrial planets) formed via the accretional build-up of planetesimals and larger Moon-sizes protoplanets. The heat from this process melted the proto-Earth, resulting in a magma ocean that allowed the heavy elements to sink towards the centre and the lighter elements to float towards the surface. As a results of this planet-wide differentiation, the interior of the Earth contains an iron-rich core and a silicate-rich mantle. This differentiation should also have caused the siderophiles (which are “iron-loving” metals, like gold, copper, platinum and osmium) to be depleted from the crust and mantle and be locked up in the Earth’s iron-rich core. However, the mantle is surprisingly abundant in siderophiles. One hypothesis to explain this is the “late veneer” theory, whereby primitive meteorites were accreted by the Earth and added to the mantle after the core had formed. This period of smaller impacts is thought to have lasted about 500 million years, ending 4-3.8 billion years ago. To test the late veneer hypothesis, researcher need to determine the composition of the Earth’s mantle before and after the bombardment period. Using some of the oldest rocks in Greenland, Willbold and collaborators have made extremely sensitive measurements of the tungsten isotope ratio. 182-W results from the radioactive decay of the now-extinct hafnium isotope 182-Hf. During the formation of the Earth’s core, the siderophile tungsten would have sunk to the core, while the non-siderophile hafnium would have stayed in the mantle. After core formation, the 182-Hf in the mantle would have continued to decay, resulting in an enrichment of 182-W in the mantle. The half-life of 182-Hf is 8.9 million years, so after about 50 millions years there would be no more 182-Hf left in the Earth’s mantle and hence from that point onwards the amount of 182-W in the Earth’s mantle would remain fixed. Any changes in the tungsten isotope ratio after this time must have come from other material added to the mantle. In this week’s edition of the journal Nature, Willbold et al. present results from ultra high-precision analysis of tungsten isotopes in a sample of 3.8 billion year old rocks from Greenland which support the late veneer hypothesis. If the late veneer added just 0.5% of the Earth’s mass in the form of primate chondrite meteorites, which are low in 182-W and enriched with other precious metals, this would lower the mantle’s overall 182-W abundance. Willbold et al. find that the old Greenland rocks are enriched in 182-W relative to the Earth’s average, which they argue supports the late veneer theory. Willbold et al. also speculate that this late period of meteorite impacts might actually have initiated the large-scale convection in the Earth’s mantle which drives plate tectonics. In astronomy, “metals” are all elements heavier that hygrogen (H) and helium (He). The metal content of a star is determined by its metallicity, Z, which is the mass fraction of elements other than H and He. The very first stars in the Universe should only contain H, He and traces of lithium (Li), as these were the only elements synthesised in the Big Bang – all other elements are created by stars. The first stars in the universe are through to have been very massive and very hot, and would have quickly ended their lives in a supernova explosion. If these stars were very hot, this could wipe out their Li which is destroyed at temperatures greater than about 2 million degrees. The resulting supernova explosion from the very first stars would have polluted the surrounding interstellar medium with metals, which are very important for the creation of the second generation of stars. Metals act as a very effective cooling agent, and for gas clouds to collapse to form low-mass stars, they need to cool enough so that gravity can overcome the gas pressure that holds the cloud up. If it is true that the first stars were all massive, then none would have survived today, since massive stars live fast and die young. Low-mass stars, on the other hand, live for an extremely long time and stars with masses less than 0.8 solar masses can be over 13 billion years old and detectable today. So astronomers have been hunting for low-mass, low-metallicty stars which will provide clues about the early universe. Using the Very Large Telescope in Chile, a team lead by Elisabetta Caffau have discovered an extremely metal-poor star in the halo of our galaxy. The star, SDSS J102915+172927, has a metallicity of Z < 6.9 x 10-7, which is at least five order of magnitude lower than our Sun. The star joins a small group of very metal-poor stars, which all have a very low iron content, but a surprisingly large amounts of carbon, nitrogen and oxygen relative to their iron abundances. SDSS J102915+172927, however, does not carbon, nitrogen or oxygen. In fact, the only metal yet detected in the star is calcium. Surprisingly, no lithium has been detected, which suggests that the star must have experience temperatures above 2 million degrees (though the current effective temperature of this low-metallicity dwarf is expected to be a few thousand degrees). Using the NASA Wide-field Infrared Survey Explorer (WISE), astronomers have found the coolest stars yet, confirming the existence of the spectral class L dwarfs. Stars are often classified by their spectral type which can be used to determine their surface temperatures (also known as effective temperatures). Since the confirmed discovery of brown dwarfs 1995, the hunt has been on for cooler and cooler stars and sub-stellar objects. 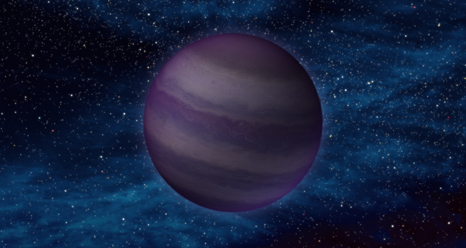 Many brown dwarfs are of spectral class M, which is dominated by strong absorption of TiO and VO. But even cooler stars were found with the Two Micron All Sky Survey (2MASS), leading to a new spectral classification. The optical spectra of L stars show strong metal hydride lines (FeH, CrH, MgH, CaH) as well as neutral metal lines, while their near-infrared spectra show absorption bands of H2O and CO. L stars have effective temperatures of 1,400-2,000 K and are a mix of both very low mass stars and brown dwarfs (sub-stellar objects). Another new spectral class is the T dwarfs. Their near-infrared spectrum shows methane (CH4) absorption bands, similar to the atmospheres of the giant planets. Their optical spectra lack the metal hydrides of the L stars and instead has very broad metal Na and K absorption features. The surface of T dwarfs is between 700-1,300 K and these are all thought to be brown dwarfs. What about even cooler stars (or sub-stellar objects)? Things get a bit murky as we move to cooler and cooler brown dwarfs, as it becomes tricky to separate them from giant planets. Deacon & Hambly (2006) proposed yet another stellar class comprising ultra-cool dwarfs called Y dwarfs. These hypothesised Y dwarfs have effective temperatures less than 500 K. And this week the discovery of six Y dwarfs found with the NASA Wide-field Infrared Survey Explorer (WISE) was announced. These stellar objects have effective temperatures between 500 K and 300K, and the new record holder as the coolest brown dwarf yet discovered is WISE 1828+2650, with an effective temperature of just 300K, which is about 25°C – cooler than a human body! Read more at the NASA press release NASA’S Wise Mission Discovers Coolest Class of Stars, and the discovery paper by Cushing et al. (2011).